Benicia, Calif. (2019) – Red Line Synthetic Oil, a leader in the performance lubricants industry, today announced a partnership with legendary motorsports training academy, the Skip Barber Racing School. Going forward, Red Line products will be the exclusive supplier of lubricants used by the school. The company will also provide technical support, ensuring that the Skip Barber Racing School is outfitted with the highest quality products available at all times. 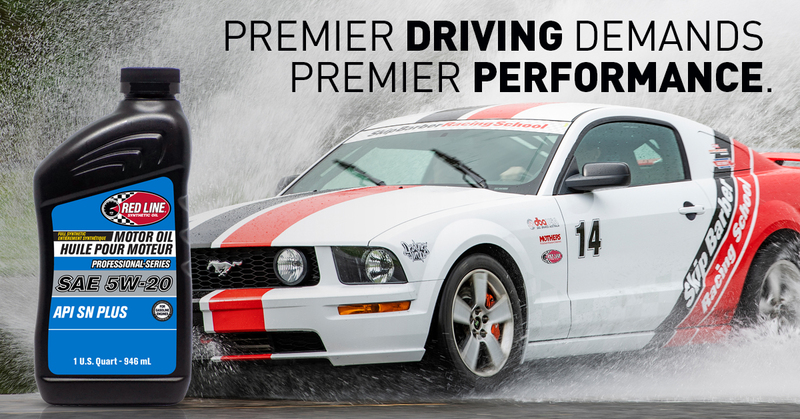 As the official lubricant supplier of the Skip Barber Racing School, Red Line will outfit each Mustang GT in Skip Barber’s fleet with motor oil, transmission fluid, gear oil and brake fluid to ensure the cars are fully equipped to handle the demanding race track conditions, day in and day out. Each vehicle will see over 150 track days per year, so high-quality lubricants are essential. To signify the partnership, Skip Barber’s Mustang GTs will prominently feature Red Line’s logo on the vehicles. Red Line Synthetic Oil and the Skip Barber Racing School were founded in the 1970s and quickly became renowned leaders in their respective industries. Both companies have demonstrated an unwavering commitment to the world of motorsports. Skip Barber graduates have distinguished themselves with podium appearances in all the major, international series including Formula 1, NASCAR, IMSA, Blancpain GT World Challenge America, CanAm and IndyCar. Similarly, Red Line’s products have been used by championship winning teams to give them the utmost edge over the competition. Through this partnership, the two businesses will continue their mandate of excellence in motorsports in a new and exciting way. For more information on the Skip Barber Racing School, please visit www.skipbarber.com or follow the Skip Barber Racing School on Instagram, Facebook or LinkedIn. Founded in 1974, the Skip Barber Racing School is the premier racing school in North America, conducting racing schools, Teen safety schools, advanced driving schools and corporate team building events at road racing tracks across the country including Lime Rock Park in Lakeville, CT, Laguna Seca in Salinas, CA, New Jersey Motorsports Park in Millville, NJ, Road Atlanta in Braselton, GA, Gateway Motorsports Park, Madison, IL and Sebring International Raceway in Sebring, FL. Since 1983, the Skip Barber Racing School has trained over one-third of all Indy 500 competitors and one-quarter of the NASCAR Cup competitors and is the official racing school of the Blancpain GT World Challenge, America. Skip Barber Racing alumni have won every major U.S. auto racing championship.